Debunking Christianity: A Screwed Up Book From the Beginning: Does the Bible Ever Know What It’s Talking About? A Screwed Up Book From the Beginning: Does the Bible Ever Know What It’s Talking About? Over a decade ago I debated a Christian apologist over the fact that the Biblical writers had no idea of what the human brain was. Facts will clearly prove that if this very important word is merely a symbolic term in the New Testament, then how are we to know whether (if ever) other important terms such a Resurrection, Heaven, Hell, Virgin Birth, Salvation and the many other doctrinal terms are not themselves simply symbolic terms and the entire Bible’s theological World View is little more than allegory? Fact is, when placed in a historical perspective, this concept of the heart would be expected of any ancient Near Eastern culture whose understanding of human anatomy was hardly a scientific fact. Most ancient cultures felt the heart was the seat of emotions because it reacted - via the heart rate - depending on the emotional state of the person. Thus an ancient Semitic person was known to think and feel emotions with his or her heart (Compare Hebrew lêḇ with Akkadian “libbu” / “seru“). The Semitic Biblical tradition has other claims of organs used as the seat of emotions drawn from her neighbors. As such, the Hebrew Bible also understands the liver (k·kā·ḇêḏ), the bowels (qereb, mê·‘ay) and primarily the heart (lêḇ) as emotional seats for mental states which were all later centralized to one organ in the New Testament (under Hellenistic / Greek influence such as the LXX) as the heart. 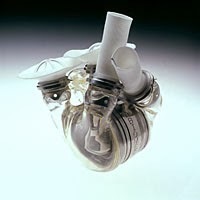 This concept of the heart was symbolized over a thousand years earlier by the ancient Egyptians who, in the process of mummification of their pharaohs as gods for eternal life, the priests would save all the major internal organs in urns (including the heart) and removed the brain through the nasal cavity throwing it away as totally useless. For two thousand years the Church has continue this erroneous concept about the heart. Gospel tracts tell the "sinner" that his heart is corrupt and wicked and that "only Jesus can heal a sinful heart" and that all people "must give their hearts to Jesus". In the last days all humanity will stand before God and be judged on the thought and intents of the heart. Catholic icons of both the Virgin Mary and Jesus often show each with a sacred (often wounded) hearts shaped much like the symbol we would see on Valentine cards or love letters. While watching news reports from the Vatican on the death watch of Pope John Paul II, a major news reporter stated that: "This heart that loved his Church and the world so much is now starting to fail." After his death, a Cardinal stated that John Paul II's body would be interned in the grotto under St. Peter's Basilica, but this Polish pope's heart would be removed (cut out) from his body and sent back to his native Poland for burial to show his love for his country. With respect to the above (and as my summation), as long as Christianity pushes theology (which is of itself a very flawed reasoning system drawn from a pre-scientific ancient world view) as the dogmatic basis for the truth, then any modern society is doomed to have its scientific advances hobbled to an anachronistic mythical religious past. Reality proves, over and over, that the Bible is literally Eat Up with erroneous mythology. In conclusion, the next time a Christian missionary (or Gospel Tract) tells you that you MUST get your heart right with Jesus, simply ask them if they really know what the hell they are talking about!